Ah, the back cover blurbs! One of my pet peeves. Warning: this will be long. Short answer: I don’t trust blurbs. I tend to do my book shopping online so I look at reviews. I also get recommendations from other people. Longer: I haven’t read back covers for a long time simply because I’ve been burned by them too many times. There are apparently hundreds of ways that the blurb can be wrong and I’ve seen most of them. They can be anything from slightly misleading to absolutely wrong. In my humble opinion, even blurbs that are only slightly wrong might raise wrong expectations and so sour the reading experience. Examples which contain spoilers for Lois McMaster Bujold’s Shards of Honor and Kristine Kathryn Rusch’s the Disappeared. I’m a fan of both writers and hugely enjoyed the books. Lets look at the actual heroes: Sturm Brighblade (who, surprisingly enough, is a knight), Riverwind (a barbarian), Goldmoon (another barbarian… but she’s a woman so maybe she doesn’t count because she’s only the catalyst to the whole damn plot! ), Caramon (who is a fighter), Tanis Half-Elven (another fighter and the group leader), Flint Fireforge (a dwarf but not “elf-like” in any way, shape, or form. Also a fighter), Raistlin (a wizard but not a black wizard), and Tasslehoff Burrfot (a kent which is a sort of halfling. Another fighter). Later they are joined by two elves Laurana and her brother who are both fighters. How the blazes can you describe this group in the above way! The answer, of course, appears simple: you haven’t read the book in the first place! Now, getting the characters only half right or completely wrong might still be a minor transgression but it can still influence people’s expectations and therefore their reading experience. Some blurbs have more sinister errors: a, wrong plot, b, part of the plot is wrong, c, it reveals a surprise plot twist, or d, reveal the surprise ending! What the hell, marketing people??? None of the above are the right way to sell a book! Often enough, the back cover is the only way to market that book. That’s not the right place to save money! In the wrong place, at the wrong time, for the wrong reasons. She even wore the wrong uniform; Cordelia Naismith, Betan Expeditionary Force, had been hurried into battle still wearing her old tan Astronomical Survey fatigues. Now, captain of a throwaway ship on a mission of deception, she convoys a weapon of wicked subtlety to entrap and destroy an enemy armada. Part of this might be true… from a certain point of view. Problems: this is not the start of the book! The blurb starts about halfway into the book! I have no idea what’s going on with the whole “wrong war, wrong uniform” thing. The uniforms aren’t important at all. Why mention them in the blurb??? Cordelia’s a single soldier in a war; she has no control over “wrong wars”. Lord Vorkosigan is her lover, not “chief opponent”, mentioning the deceptions is also a major spoiler and only starts after the halfway point of the book. This sounds once again like the person who wrote this hasn’t bothered to read the book. I dearly hope s/he wasn’t paid for it! Umm. Cordelia married the love of her life, not her arch enemy and she was most definitely not forced into it. I also find it troublesome that this is supposed to be the description of the two books and yet, it describes the end of the book one and so manages to spoil the first book pretty much completely. Spoiling again one of the plot points in SoH; the romance. I also find the sentence “Will Mother ever understand?” mightly peculiar because Cordelia’s mother isn’t seen until the end of the book. It also makes it feel like Cordelia is twelve and constantly worrying about what her mother thinks. In reality, Cordelia is in her mid thirties and a ship captain and most definitely not worrying about her mother’s opinions. Also, this makes it sound like SoH is 100% romance. Again, the impression is wrong; the romance is perhaps half of the plot and is also quite understated. Then there’s the Disappeared by Kristine Kathryn Rusch. The actual back cover blurb (which I don’t have right now, sorry about that) mentions by name only one of the three POV character who is, perhaps not coincidentally, the only male POV character. There’s a reference to another POV character but the third one, the female detective, is left out completely. 1. Murder is not sanctioned. Alien laws are agreed to be valid even on human grounds. I find that to be quite a different concept. 2. You’re pretty safe if you don’t commit crimes. Now granted, it’s sometimes hard to know what aliens consider crimes but the claim that “no one is safe” is pure hyperbole. I guess I’ve ranted enough. But really, I don’t trust blurbs. I had a wonderful time even though I wasn’t able to keep awake the whole time. I’ll definitely have to think about time management more the next time. I even won a prize at Dana‘s mini-challenge! After 4 AM here which would have been hour 17. Fell asleep. That would depend on what the reader is interested in. But I’d definitely recommend “To Say Nothing of the Dog” by Willis. Of course, it’s not short. Nope. Everything was great! Thanks very much for the awesome organizers! I didn’t finish any of them but I reached my goals for the read-a-thon. “To Say Nothing of the Dog” by Willis. I listened it around 6 hours which is about 1/3 of the whole book. “the Spirit Gate” by Elliott. I read 102 pages so I reached my goal! “the Empress of Mars” by Kage Baker. I read 140 pages so I reached my goal! Both Willis’ and Baker’s books were very enjoyable. Perhaps Willis a bit more because it has more comedy. The Spirit Gate. For some reason I didn’t click at all with Elliott’s writing style. Or maybe I’m still in epic fantasy fatigue. I just thought it’s terribly slllooowww. Very! Probably as a reader but I might take on a mini-challenge. Update: I had to cave in and slept for some hours. But now I’m back up and reading! In honor of Miss Adison who is 4, I’d like you to tell me 4 of your favorite books. To play along you need to link and/or post pictures of your favorite 4 reads either from childhood or from now. Lois McMaster Bujold’s Cordelia’s Honor. It’s character centered science fiction. Steven Brust’s Book of Jhereg. One of my favorite fantasy settings. Anne Logston’s Shadow Hunt. The second book in one of my favorite fantasy series. Roger Zelazny’s Guns of Avalon. The second in his Amber series. Book count: Spirit Gate: 102 pages, so I reached my goal there! Empress of Mars: 30 pages, To Say Nothing of the Dog: 4 hours of listening. Right now I’m writing this survey. 😉 Okay, enough with the lame jokes. Kage Baker’s Empress of Mars. Tough one. I like them all. Maybe the Hellboy albums and Harrison’s second book. I live alone, so no. It takes a lot of time to follow the challenges and write the posts. Also, how quickly I became tired. I used to be able to stay up all night! None, you’re doing a great job! I would definitely pick shorter books! It’s around 3.30 AM here, so yep. I’ll leave that to more experienced readathoners. What book or books do you return to read again and again and why? Steven Burst’s Vlad Taltos series which begins with “Book of Jhereg” (fantasy) and Lois McMaster Bujold’s Vorkosigan -series which starts with “Cordelia’s Honor” (SF). Both have interesting characters and settings. They also have humor and there’s just something in the writing style that I click with. Of course, when I read a series the characters start to feel like old friends and it so it’s comfortable to return to their company (so to speak). For some reason, I rather enjoy rewatching favorite TV shows and rereading favorite comics more than rereading books. Maybe it’s because shows and comics take less time than books? I don’t know. Nymeth’s challenge is Time for Comics. My mini-challenge is simple: what I suggest is that you take a break from your book and spend at least 10 minutes reading a webcomic. I have a couple of favorite webcomics (the Order of the Stick which is a fantasy comic aimed at roleplayers and the steampunk adventure comic Girl Genius) but I’m woefully behind with them. So instead I read a new comic suggested in Nymeth’s post: No rest for the wicked. It’s a fantasy tale with elements of quite a few fairy tales in it. The main character is the youngest princess who has an allergy to peas and hasn’t been able to sleep well no matter how many mattresses she has. It looks fun! Page count: only about 60 pages of the Spirit Gate but I’ve also listened many hours of Willis’ book. 1. Take a break from your reading and wander around your house. 2. Take digital photos of your non-book collections (if you don’t have a digital camera, go to Google Images and find a representative image of your collection or collections). 3. 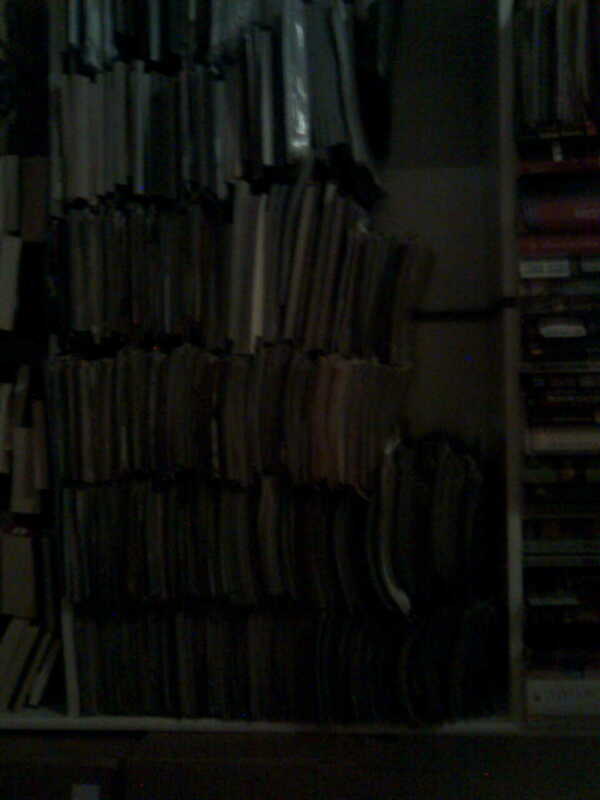 Post your photos or images and tell us a little about your non-book collections (just a few sentences is fine). 4. Come back here and add your link to your post in Mr. Linky at the bottom of this post (please use a DIRECT/perma-link to your post and not just to your blog). I collect comics both individual issues and trades. Mostly superhero comics which can be soothingly black and white compared to real life. 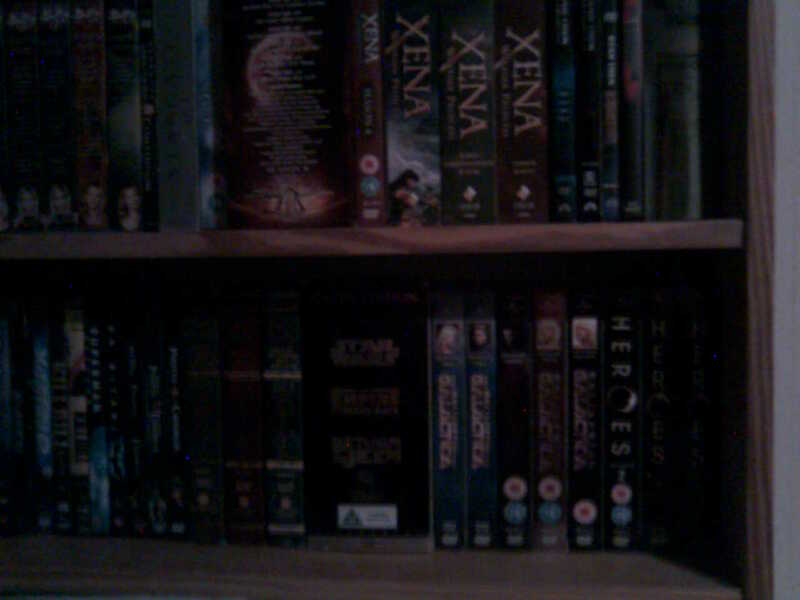 Various TV shows on DVDs. I tend to watch a whole series to the end. Some more of my favorite shows.